Automatic charging during the day, sunlight automatically when in the dark. Well suited for outdoor use, adds color and light to your garden or patio for evening events. Quick and easy to install, just hang your lantern on the hook at the top. 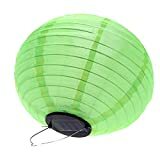 You can even attach a rope chain, this hanging lantern with solar energy. Sunlight can work up to 10 hours after fully charged.